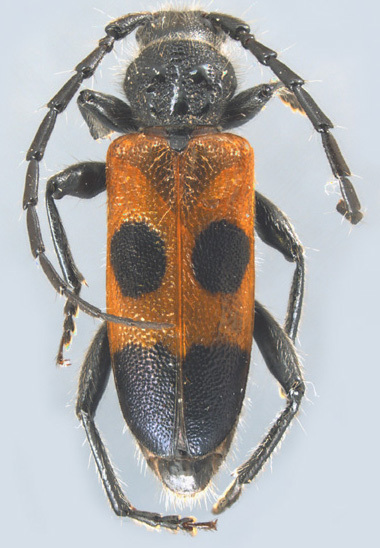 Beetles in the family Cerambycidae are often called longhorned beetles because many species possess extremely long antennae, which may be as long or longer than the entire body. However, some species have short antennae, and may be confused with other families of beetles. Many longhorns are large and colorful, which has lead to the group being very popular among collectors. Consequently, it has become on of the best known beetle families in North America. Over 20,000 species of Cerambycidae have been described, over half of which occur in the Eastern Hemisphere. In North America, over 900 species from 300 genera have been reported. Cerambycids can be characterized by their generally cylindrical and elongate body, which ranges from 2 to 60 mm; their long filiform antennae, which may be one-half to twice the length of the body; notched eyes, from which the antennae arise; and the tarsal formula, which is 5-5-5, but appears to be 4-4-4 because the 4th segment is small and not obviously seen. The larvae of longhorned beetles bore into dead and living wood and woody plants, and many species are considered to be serious pests because of the damage they cause in living trees or untreated lumber. However, they also provide a key role in forest ecosystems by breaking down wood.